On Friday, October 16th, 2015, I attended lectures by Dr. Richard Hansen, University of Utah, and Dr. Michael Coe, Yale (emeritus). The event was the first biannual Mesoamerican Talks Conference sponsored by the U of U Department of Anthropology. Hansen's presentation was very similar to the one he gave at the Library of Congress in April, 2014. You can watch a video of that presentation here. If you download the transcript, beware that it is machine-generated and therefore riddled with errors. A portion of Hansen's presentation is abstracted in the article "Founding Civilizations." Hansen did his undergraduate work at BYU, received his PhD from UCLA, and was a Fulbright Scholar in Guatemala. He heads the massive Mirador Basin Project (a consortium of 62 universities) and has authored more than 300 academic publications. Hansen is probably the top field archaeologist working in Mesoamerica today. 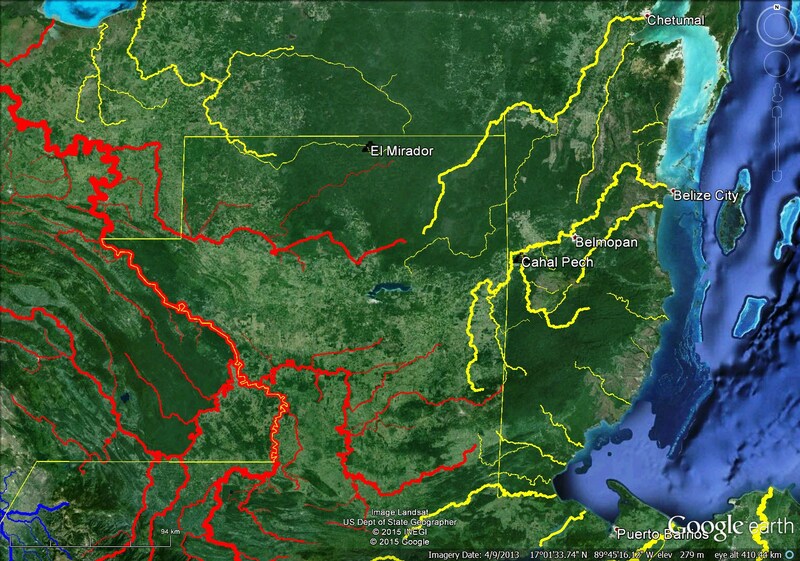 All remains recovered by the Mirador Basin Project are processed at a lab in Guatemala City. 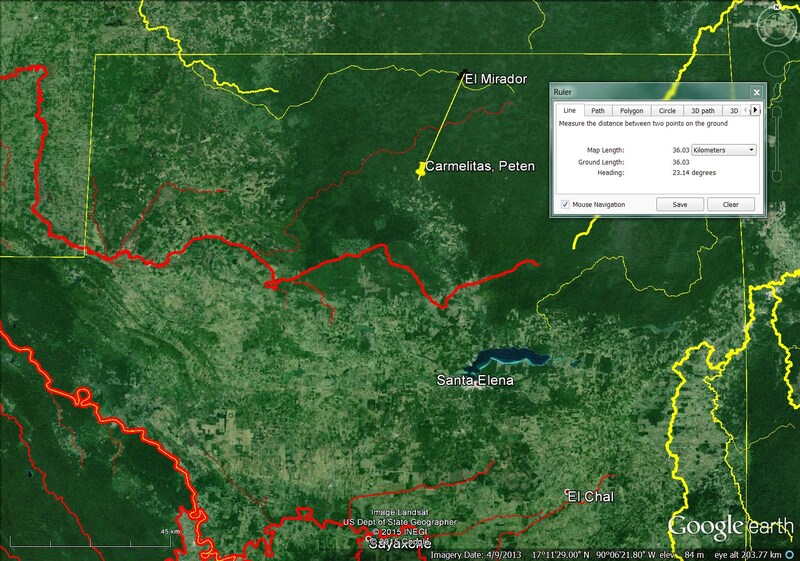 This map shows the locations of El Mirador and the closest town with a road. 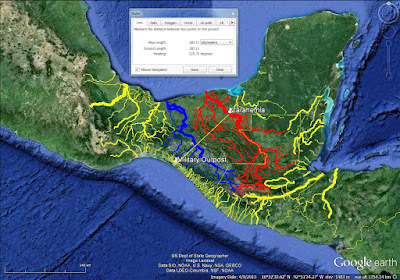 The Mirador - Calakmul Basin contains 51 sites mapped so far. Results from a recent LIDAR survey (38 hours in the air, 700 square kilometers analyzed) are just now coming in, so that number will undoubtedly increase. Corn was being grown in the basin as early as 2,600 BC. We know that from pollen samples found in lake sediment cores. El Mirador, the largest site in the basin, began ca. 1,000 BC, reached apogee ca. 300 BC, and was abandoned ca. AD 150. A temple with a roof comb was erected in the basin during the 720 - 600 BC time frame. From 1,000 BC to 800 BC sea shells were being used as money. Sea shells as a form of currency also show up in Cahal Pech, Belize during this same time period. 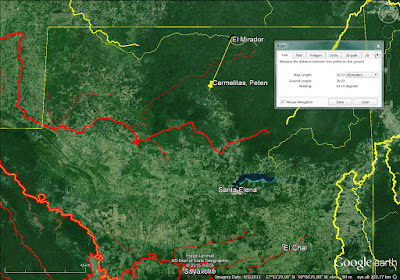 This map shows El Mirador and Cahal Pech in context. Olmec sites were generally aligned N/S. 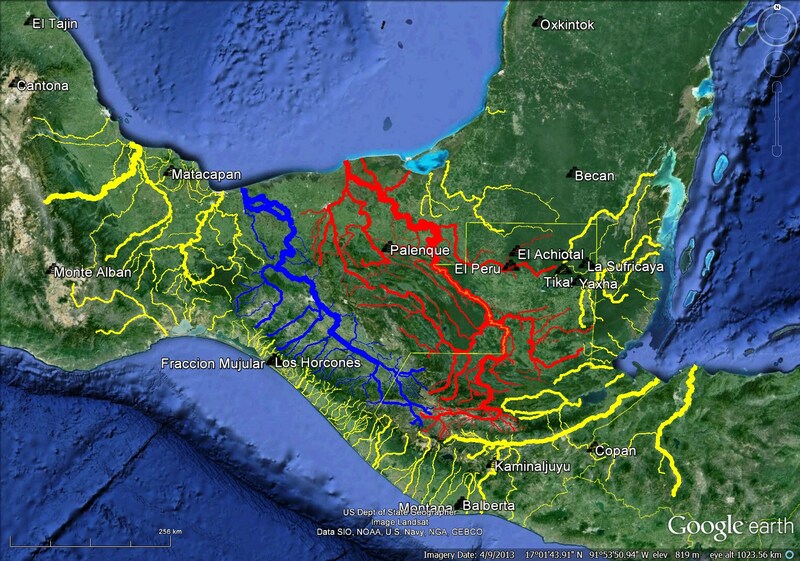 Early Maya sites were usually oriented E/W. El Mirador has 52 square kilometers of monumental architecture connected by causeways. This makes it the largest city in the Americas, larger even than Teotihuacan. For a size comparison of many ancient American sites, see the article "Site Sizes." 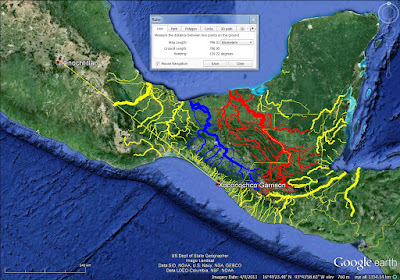 A typical causeway in the basin, called sacbe in Mayan, was 40 to 50 meters wide. The late pre-classic moat around Tintal was 10 times larger than the widely-publicized one around Becan. The Tintal moat was 40 meters wide and 10 meters deep. El Mirador also had a moat around it. This map shows the three sites protected by moats. Hansen said the largest structure at El Mirador, Danta, is built on a base 600 meters wide. The pyramid itself is 320 meters wide and 76 meters tall. It's volume is 2,800,000 cubic meters. This makes it the largest pyramid in the world by volume and the tallest in the Americas. The Ancient Maya by Sylvanus Morley is still the best book on the subject. The Olmec flourished from 1,400 BC to 400 BC. San Lorenzo was destroyed 900 BC and power shifted to La Venta. There were Maya living in a barrio in Teotihuacan. Teotihuacan was an urban civilization with planned avenues. The population of Teotihuacan at apogee was much larger than Tenochtitlan at contact. During the AD 350 - 450 era, people from Teotihuacan were all over the Maya area. The Teotihuacan warrior was an anonymous cultural icon, not an individual portrayal. The Teotihuacanos did not venerate their rulers like the Maya did. The noted Tikal ball court marker is in Teotihuacan style except for the Maya glyphs. This is an image of the aforementioned Tikal ball court marker. The mural from Uaxactun structure B-XIII depicts a Maya lord and Teotihuacan warrior. 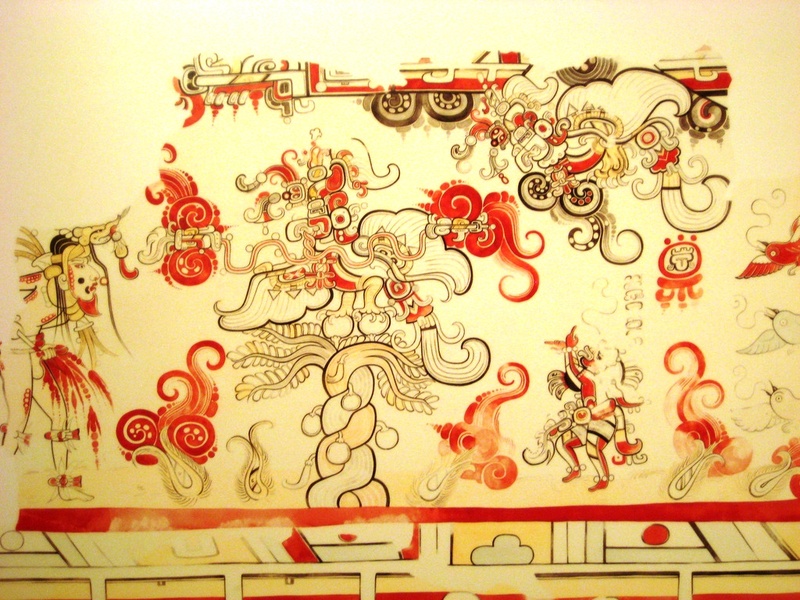 A mural from La Sufricaya shows Teotihuacan warriors. We find Teotihuacan influence from northern Yucatan to the Pacific Coast of Guatemala. Ergo, Teotihuacan was an empire. Michael Coe prides himself on being something of an iconoclast among his peers. He gently chided his fellow Mesoamericanists for being reluctant to recognize Teotihuacan's status as an empire. He analogized that the Maya in Teotihuacan were like the Greeks in Rome. The presence of erudite Greeks in the imperial capital did not detract from Rome's status as an empire. This map shows sites with known Teotihuacan presence. There is much more archaeological evidence for the Teotihuacan empire than for the better-known Aztec empire. 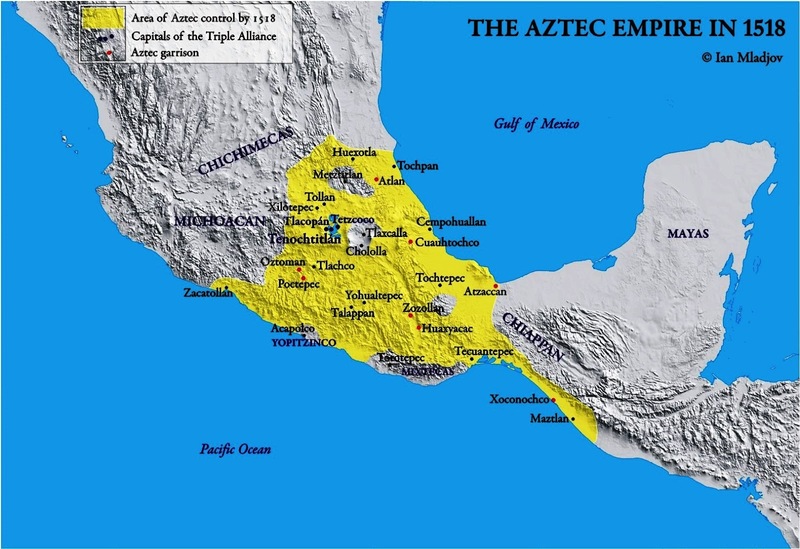 Anthropologists have no problem accepting the Aztec empire because it is described in historical sources, even though it is thinly-attested archaeologically. The Aztecs maintained a military garrison in the Soconusco, which they called Xoconochco, to protect their sources of cacao. The name Xoconochco in Nahuatl refers to chocolate. Xoconochco was approximately 800 air kilometers distant from the Aztec capital, Tenochtitlan. Coe then launched into a discussion of one of his favorite topics - chocolate. He and his late wife authored the best-selling "The True History of Chocolate" now in its 3rd edition. ka-ka-w(a) is Mayan for cacao. Chocolate is a complex substance containing theobromine & phenethylamine. Traces of these chemicals can be detected in ancient pots and jars. Barra pottery vessels from the Mokara culture of the pre-Olmec Soconusco held chocolate. The Soconusco was the ancient home of chocolate made from fermenting cacao. Uaxactun burial A22 had chocolate in Teotihuacan-style pottery. Cacao was used as money and appears on many tribute lists. Cacao was anciently associated with marriage. Chocolate had prestige value. Heather Hurst is the greatest archaeological artist of all time. This image from one of the murals at San Bartolo illustrates her work. In Chaco Canyon, New Mexico, the Pueblo Bonito apartment complex yielded cylindrical vases with chocolate residue. Patricia Crown, archaeologist with the University of New Mexico, made this discovery. Hohokam pottery from Snaketown (near modern Chandler, AZ) held chocolate. The Pima and Papago are modern Hohokam. Turquoise from the north was traded for cacao, scarlet macaw feathers, and copper bells from the south. AD 900 is when turquoise first appears in the archaeological record in Mesoamerica. In the post-classic, turquoise was even more valued than jade. 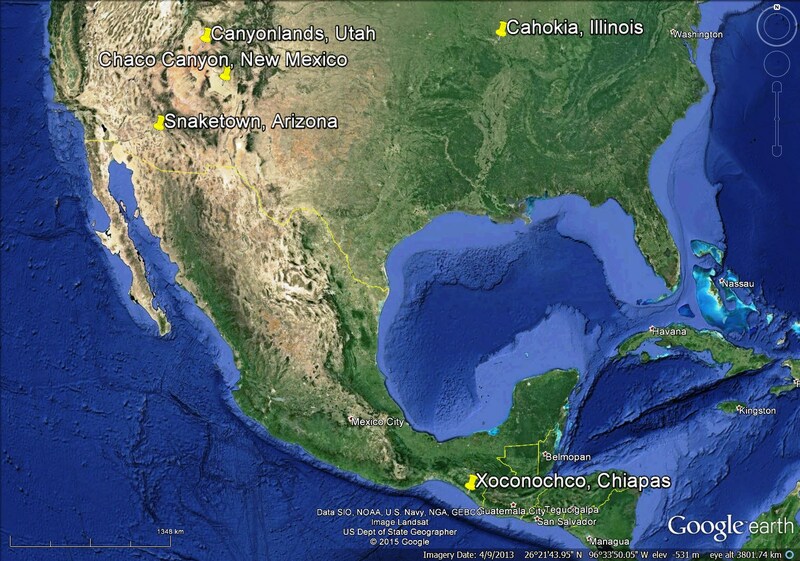 The Aztec pochteca traders got as far north as New Mexico. Dorothy Washburn from the University of Pennsylvania has found traces of chocolate near Canyonlands National Park, Utah that dates to ca. AD 770. Chocolate has been found at Cahokia, Illinois and other post-classic Mississippian culture sites in North America. Snaketown had a ball court with rubber balls. Many copper bells from western Mexico have been found in Hohokam sites. Maya vase K578 shows God N emerging from a snail shell. Snaketown has a similar motif. This is Justin Kerr's photograph of vase K578. The Maya carved pyrite mirrors. Similar carved mirrors have been found at Snaketown. 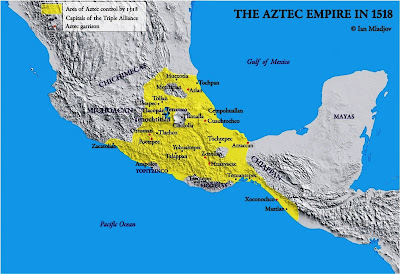 Coe said the Toltec Empire flourished from AD 900 - 1200. It had a presence in Chiapa de Corzo, Chiapas. 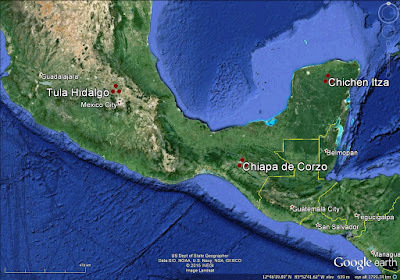 Major centers were Tula, Hidalgo and Chichen Itza, Yucatan. Don Forsyth of the BYU Anthropology faculty spoke with me after Coe's lecture. Don is not entirely convinced the Toltecs made it to Chiapa de Corzo. The North American Mississippian culture is post-classic. These people built temple pyramids in a style reminiscent of Mesoamerica. Cahokia is the largest site. It dates to AD 1050 - 1200. Metallurgy went from South America to Central America before it reached Mesoamerica. Cast gold objects from Panama were thrown into the sacred cenote at Chichen Itza. 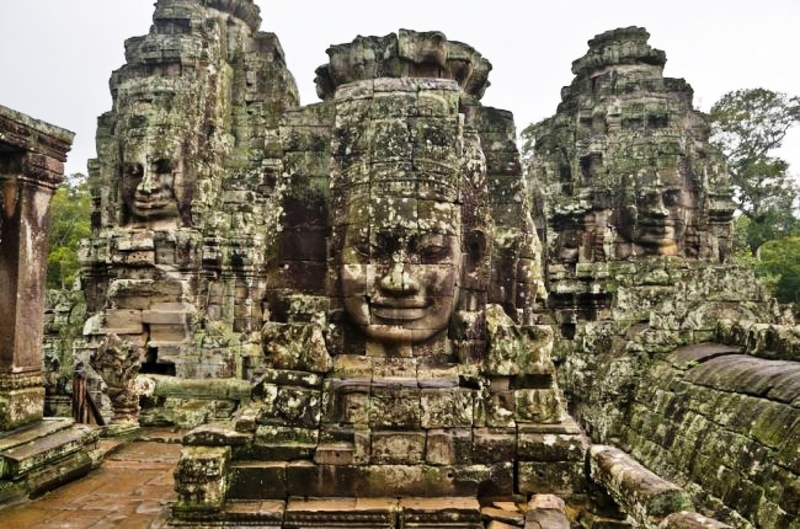 Coe has spent considerable time studying the Angkor aka Khmer culture from Cambodia. 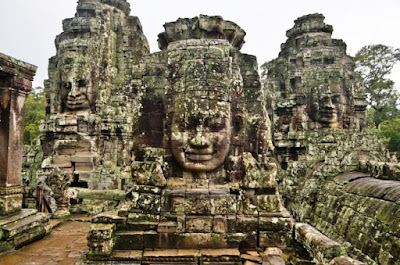 Angkor Wat is the most famous site from this area. 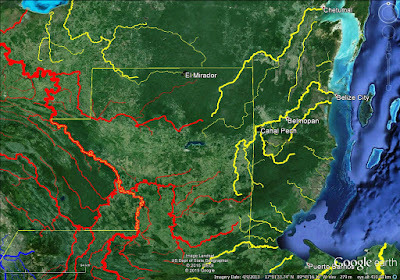 Coe is convinced there was significant contact between Southeast Asia and the Maya. He said if he had his life to live over again, he would spend at least half of his career working on the problem of of cultural diffusion between Southeast Asia and Mesoamerica. The Maya are the only civilization in the New World that historians of science are interested in. Paul Kirchhof invented the name Mesoamerica. 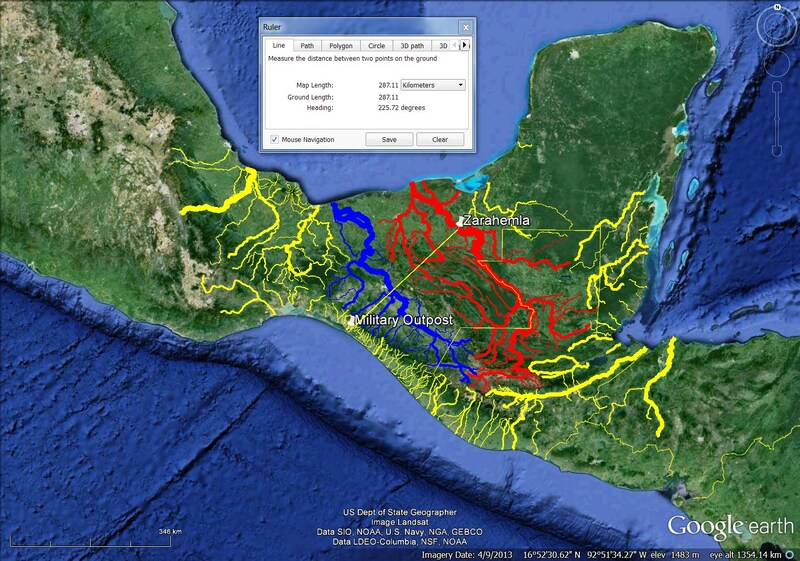 Cacaxtla was an intrusion from the Maya area into central Mexico. Pochteca traders with their large carry packs are shown. God L, the wealthy trader deity, is prominent in the iconography of the site. There is a writing system from Xochicalco. God L and the maize god are both represented, both associated with cacao. Black and red was an Aztec phrase meaning "east." [Chapter 4 in Stephen C. Compton's important Exodus Lost, entitled "Black Land Red Land," shows evidence that this Aztec idiom originated in Egypt.] The Aztecs had a great deal of Maya influence in their culture. This ends the data presented by Hansen and Coe. We can map the approximate extent of contiguous Maya territory (354,325 square kilometers) which consisted of the northern lowlands in the Yucatan Peninsula (approx. 117,120 sq. 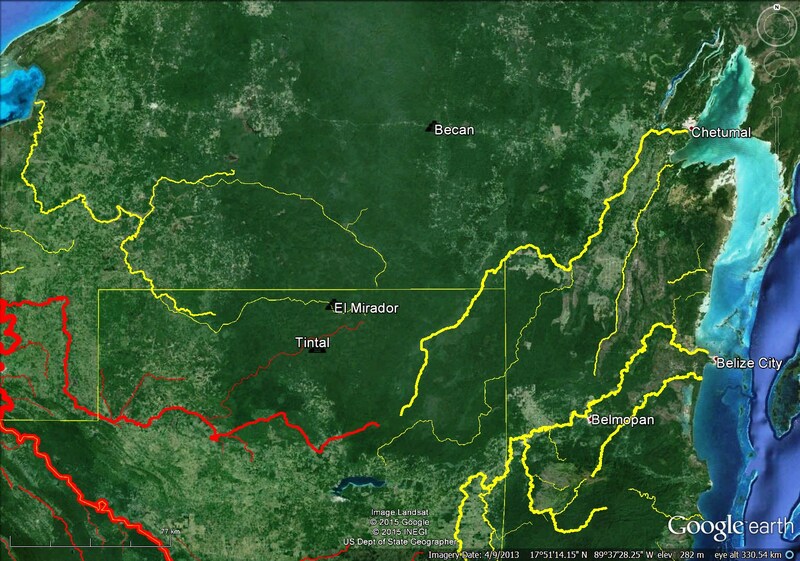 km), the southern lowlands (approx. 151,782 sq. km), and the highlands (approx. 85,423 sq. km). 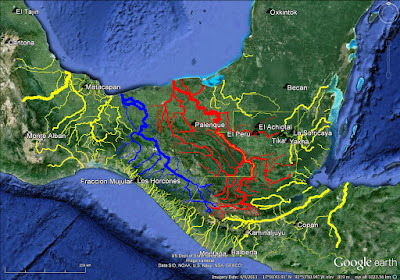 One of the characteristics of Maya land use patterns was that they left relatively lightly-settled wild areas in between city states. We see this same pattern of wilderness adjoining developed areas in the Book of Mormon Alma 8:3, Alma 16:2-3, Alma 58:13. 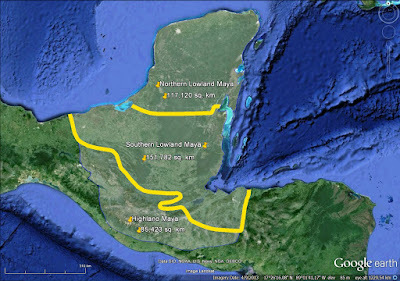 Focusing on the southern lowlands, if we assume a 50/50 relationship between lightly-settled and developed city state land areas, the approximate mean extent of a Maya city state in the region was 151,782 square kilometers divided by 2 and then divided again by 31 which equals 2,448 square kilometers. This compares very favorably with our estimated mean extent of Book of Mormon lesser land areas. See the article "Test #7 Land Areas."